Bring in your car, truck or SUV for air conditioning inspection, diagnosis and service. This means that a broken belt can have a much worse impact than simply an uncomfortable trip. The expert mechanics will take care of everything- whether it’s simply a recharge of refrigerant or maybe installing a new compressor- you’ll have peace of mind knowing that your vehicle will keep you cool and safe. While your vehicle is at the center, an Sparks Tire & Auto certified mechanic will also perform a Multi-Point Inspection to safeguard that all of the major systems in your car, truck or SUV are in good working order. • The expansion valve (sometimes called the orifice tube) is a nozzle that simultaneously drops the pressure of the refrigerant liquid, meter its flow and atomize it. If any of these components is damaged, it can turn your cool car into a furnace during the summer months. Your vehicle’s air conditioning issue could be as simple as topping off refrigerant to replacing a valve. When your air conditioning unit is not working as it should, bring your vehicle to Sparks Tire & Auto, conveniently located in St. Charles, Missouri. One of our trained air conditioning specialists will inspect your car’s air conditioner, all lines, the evaporator and the compressor for leaks and wear. Most Missouri car owners know that their vehicles need regular preventive maintenance like changing the oil and filters, rotating the tires and refilling the washer fluid. But did you know that your air conditioning system needs routine maintenance as well? Taking care of your air conditioning system can extend its life and prevent costly repair bills. Why is it critical for St. Louis motorists to get routine maintenance on their air conditioning system? First, the refrigerant contains an added lubricant. As the refrigerant circulates through the air conditioning system, its parts are lubricated. This constant lubrication keeps the parts functioning well. But over time, this lubricant is used up, and without it, the parts will eventually seize up and fail. St. Louis and more specifically, St. Charles folks should understand, however, that the air conditioner will continue to pump out cool air even without the lubricant, so you won’t know the system is sick until it actually dies. So good car care includes regularly checking the refrigerant and lubricant in your sedan air conditioning system and replacing it if needed. The second reason your air conditioning system needs preventive maintenance is that air and water can get into the system. Air, water and the contaminants they contain will reduce the efficiency of the air conditioning system and can cause corrosion of the system’s parts. Keeping the air conditioning system clean is an important practice and will extend its life and keep you from losing your cool on hot St. Louis days. Here’s a good piece of auto advice for Missouri motorists that will extend the life of their air conditioning systems: You should run your air conditioner in the winter every once in a while. This circulates the refrigerant, which lubricates the seals. That way, they won’t dry out during cold St. Louis weather. 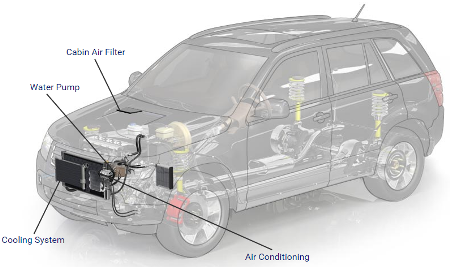 Your air conditioning system doesn’t just cool the air in your sedan; it dries it out as well. So if you have trouble with a foggy windshield, flip on your air conditioning on the defrost setting. You may be surprised at how quickly it takes care of the problem. Of course, some vehicles can’t run the air conditioner and defroster at the same time; you should check your owner’s manual or with the car maker if you are uncertain whether this feature works in your car or not. So, after learning about preventive maintenance for your A/C, you might now be wondering if your air conditioner is in trouble. Two early warning signs of a failing air conditioner are (1) the air just isn’t getting as cold as it used to and (2) there’s a strange noise when the air conditioner turns on. If you notice either of these symptoms in your car or light truck, you should bring it to Sparks Tire & Auto in St. Charles as soon as possible. Just some good auto advice to keep you cool in St. Louis and keep you on the road! Having trouble with your car or light trucks air conditioning system? Contact us for advice.